These frequently show up in the many products people use in recipes that call for Chicken Broth, Stock, or Bouillon. When I researched the chicken soup base I was using at the time, I was never able to find out for sure whether or not one of those unfamiliar, chemical-sounding ingredients contained gluten, even though I searched website after website and even called the company’s customer service. That’s when a dear friend shared with me the many benefits of bone broth. She kept telling me that bone broth provides nutrients such as minerals, electrolytes, and collagen that our bodies need. 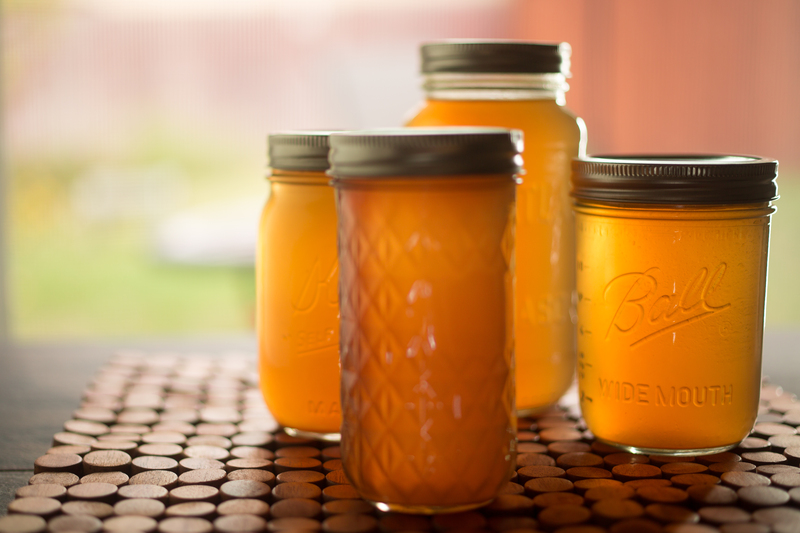 And she showed me just how easy –not to mention cheap– it can be to make your own bone broth! In fact, it’s so easy, my kids can make it! 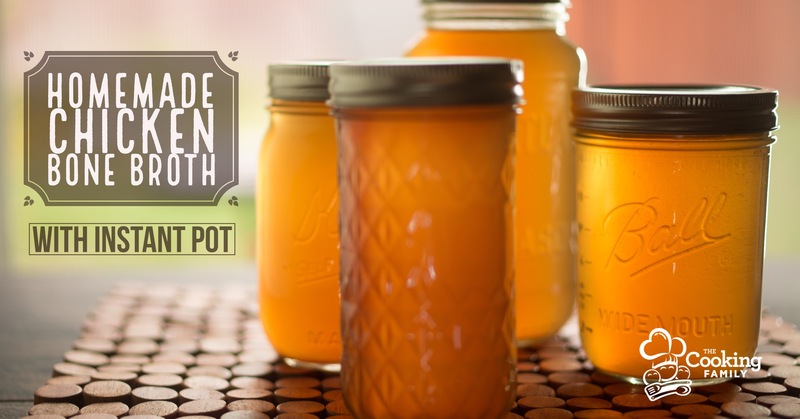 With the Instant Pot, it is incredibly easy and practically free to make in your own kitchen! Leftover Chicken Bones We save the bones from rotisserie chickens or bone-in chicken pieces from dinner. We just throw them all in zip-top bags in the freezer. The kids now have a habit of saving all the chicken leg bones on a “bone” plate at the dinner table. Afterwards, the helper in charge of clearing off the table will throw all the bones into a bag and put it in the freezer. Then those bones are ready and waiting any time we want to make chicken stock. Vegetable Scraps from our cutting board trash bowl. We use the ends and skins from onions, celery tops, leaves, and bottom, and carrot peelings and stems. After we are done cutting any of these, we place the cuttings in a large zip-top bag in the freezer. When we are ready to make bone broth, we simply grab the bag from the freezer and put a few handfuls into the pot. Black Peppercorns to taste. Start with about 10 and adjust if your broth is too peppery or not peppery enough. 2-3 Bay Leaves, depending on size of bay leaves and how much water you are using. Salt to taste. Remember that stock is a building block to making other dishes, so flexibility is key. I prefer to keep mine unsalted until I’m using it in my final dish so that when I combine it with other ingredients, the end result isn’t too salty. This is an easy-going, non-fussy recipe. You get to taste it and decide exactly how much of each ingredient you will use, and adjust each time you make it. You’ll get a feel for the taste you like, or learn to make it based on how much of each ingredient you have on hand at the time. Toss chicken bones into pot. We use 1 to 2 chickens’ worth of bones in the 8qt. pot. You’ll want to adjust the amount of bones, depending on the size of your pot. Grab a couple of handfuls of aromatic veggie scraps out of your frozen bag of vegetable goodness. I try to get a variety of onions, celery, and carrots into my stockpot, because I don’t want too many onions overpowering my broth. Ask my hubby–I’ve made some very onion-y broth before! Add black peppercorns, bay leaves, and apple cider vinegar. Fill pot to about 2/3 full with fresh water. For the 6qt Instant Pot, this is about 4 quarts. For the 8qt Instant Pot, this is about 5 1/3 quarts. For the 3qt Instant Pot, this is 2 quarts. Place lid on Instant Pot. Check to make sure Valve is set on <Sealing>. Set to <Manual> or <Pressure Cook> Program. Adjust time by pressing the <+> or <-> buttons. I prefer 120 minutes, but I have pulled broth out after only 30 minutes under pressure because I needed to use it for dinner! And it tasted great. Perhaps we didn’t get every nutrient out of those bones, but they can always be strained and re-used, if desired. And a family’s gotta eat! Sometimes NOW. Check to make sure your Instant Pot is on <High> pressure. Your Instant Pot will heat up. This step takes awhile because the pot is fairly full of water that all has to be heated to the boiling point and beyond. The float valve will pop up to show you that pressure is beginning to build. In a couple of minutes, the timer on the front will show 120 minutes (or whatever time you set it for), and then begin counting down to when your delicious homemade bone broth is ready. At this point, you can leave your Instant Pot on Keep Warm for as long as needed. Or shut it off and allow to Natural Release for hours or Quick Release if you need to use it right away. 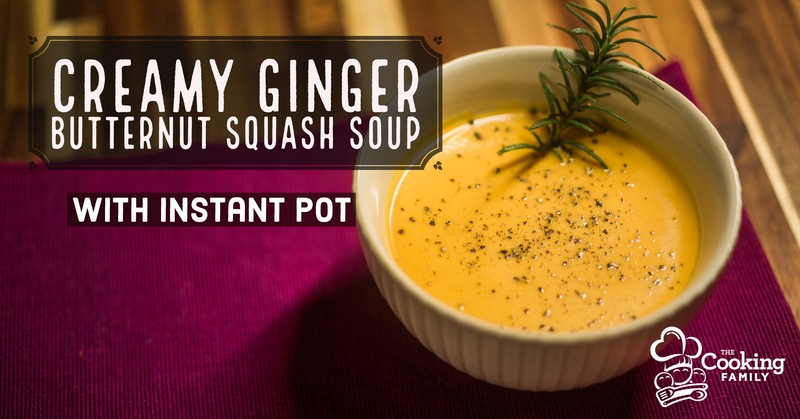 This is something I love about the Instant Pot—It is as flexible as I need it to be. I often put chicken stock on early in the day and then don’t have to think about it again until much later and I can deal with it at my convenience. It is ready and waiting for me, rather than me having to wait on it to be ready. The next step is to strain the stock and store it. Here’s what I do: Once the stock has cooled off enough to handle (remember—things finish cooking under pressure at around 240 degrees. That’s HOT!) I set up my straining rig of a 2qt measuring pitcher and a mesh strainer lined with cheese cloth. I grab my 4-cup Pyrex glass measuring cup and scoop out a quart of stock, bones, and veggies from the pot. I pour this into the mesh strainer, and add more as the liquid goes through, taking care to keep watch and not let the pitcher below overflow. Next, I empty this into half-gallon or quart-size canning jars if I plan to use it within the week OR zip-top bags if I plan to freeze the broth. If you are going the freezing route, I recommend always labeling your bags, freezing foods flat so they thaw quickly, and double-bagging to prevent leakage. Place your jars in the refrigerator or your bags in the freezer. Toss out the used up bones and pat yourself on the back for feeding your family well! It looks like a lot of steps, but if you get into the practice of keeping your bones and veggies, in no time at all you’ll be starting a batch before bed all the time! I am prepping beef bone broth for Christmas. My Filipino family is coming over and it seems quite exciting to have them try this out. I’ll be taking your advice and be avoiding all those nasty chemicals and ingredients.